A lush green landscape, awe-inspiring fjords, high-level education as well as a prosperous lifestyle come to mind when one thinks of Norway; a very peaceful and picturesque country it seems. However, people all around the world have been holding protests at Norwegian embassies, crying out for human right violations and their children. During these demonstrations, there is one word commonly heard: The "Barnevernet." The "Barnevernet" refers to the Norwegian Child Protection Service (CPS), a service normally available in almost all countries around the world. This particular one has a different story, though. The CPS has been accused of kidnapping children. A statistical analysis makes the issue more explicit. Norway has a population of about 5.2 million, and almost 1 million from this is composed of children up to the age of 14. According to the official figures of the Barnevernet, there were slightly more than 10,000 child care measures in 2015, meaning that that many children were taken from their families for various reasons. The numbers were not much different in previous years, with 9,611 in 2014 and 9,078 in 2013. 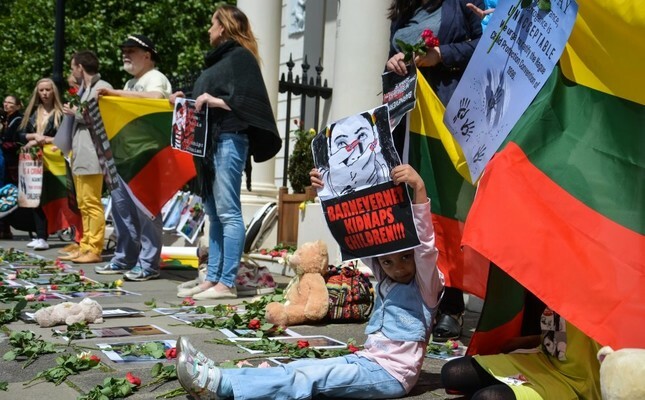 Speaking to Daily Sabah, Marius Reikeras, a human rights activist working in this field, shared his views and said that Poland with a population of 40 million have only 30 to 40 children taken into the CPS. However, the number of children taken in Norway is too high when its population is concerned. "I'm quite upset with the Norwegian government and I feel that the Norwegian government is acting very arrogantly against its own population when it comes to human rights. That's why my fight has been going on ever since 2009. I have thousands of followers for this cause and I am very motivated to continue as long as I feel it is necessary," he said. So, how does such a developed country like Norway have so many child care orders? A look into the benefits that foster families enjoy shows that the reason why child care orders are on the rise is quite clear. A foster family is given a monthly salary, paid holidays, time off and pension entitlements as well as extra money for additional requirements like changing house due to the child by the government. Norwegian child protection service Barnevernet is known for taking children away for no reason for years at a time and there is one significant reason behind this: This is indeed a profitable business. The Norwegian government offered their services in 2008 for 1.2 billion krone (approximately $144 million) on the stock exchange market. The discussions about the controversy of the state being allowed to make money out of children welfare arose significantly. For example, a wealthy Swedish family, the Wallenberg, who owns funds in London and other foreign companies, owns the biggest shares of these child services. Kjell Arne Gjeitrem, a pedagogue and one of the company's owners, said in an interview with Aftenposten, a well-known Norwegian news outlet, that at the beginning of this "business" they still had some kind of moral compass, but within time they saw that other companies were making a solid profit out of it.In 2011, he sold his shares to the Swedish Frösunda Group, owned by a large British investment company. At present, Gjeitrem owns a fortune of over 10 million krone, equal to more than $1.221 million. Gjeitrem's share is comparably insignificant when compared to the biggest shareholders. The Wallenberg Family earned almost $48 million between 2009 and 2014 by acquiring Aleris Ungplan & Boi AS, a privatized child service company. Mimmi Kvisvik, the head of the Union FO, has harshly criticized this move. "The money should have been used to give the children better help instead of making profit." The FO is an association for educators and social workers with about 27,000 members. For years they have fought for children's rights and have criticized social services. Aside from the issue's economic aspect, the reasons why these children are taken away from their families sound suspiciously bizarre. Morten Moerkved, the head of the Barnevernet in Malvik, said in an interview to the Associated Press (AP) in 2015 that the sudden removal of children only happens in "acute" circumstances, like abuse, malnourishment, deficiencies in daily care and others. He insisted that the child is only removed if considered to be in danger. However, one example shows they do not abide this principle. Residing in Norway, Hira Kiriş, a 3-year-old Turkish child, was talking about the famous comic figure Hulk, which she was inspired of, in kindergarten. Her kindergarten teacher interpreted this as a sign of domestic abuse and reported the family to the Barnevernet. Hira and her siblings - Bedirhan, 5, and Esila, 1, - were taken away from the family. Even though there was no concrete evidence of domestic violence and the physicians' report was clean, these children were held in the service for weeks. When the family was finally able to see them again, the oldest child had signs of having suffered from violence and her siblings were still wearing the same clothes the day they were taken. Fortunately, the story ended with a happy ending. Turkey's foreign ministry intervened in the case and the children were brought back to their families. Legally speaking, many families have apparently no chance to win against the government and resort to fleeing the country. According to the numbers given by the AP, 500 children escaped with their families and went back to their homeland in the last 10 years. The biggest problem with the Barnevernet, says Marianne Haslav Skanland, a human rights activist and Professor of Linguistics of the University of Bergen, is that the service relies on anonymous sources, where one cannot differ from rumor or actual danger for the child. The families that have different cultural backgrounds are victims of the Barnevernet. In the early 2010s, an Indian family's children were taken for several reasons. The Indian family was accused of emotional disconnect with the children as well as feeding them by hand, which is widespread in India, providing insufficient amount of toys to play and sleeping with them in the same bed. Following an outcry, the Indian government took action and the Barnevernet agreed to hand over the children to their uncle in India. One cannot help but to ask the following question: Where was the "real" danger for these children in this case? Line Jensen was born in 1993 and had the chance to live with her family for only three days. She was taken from the Barnevernet and has never been seen again. Jensen's mother tried to reach her but was denied as her children before Line were born were also taken from her. When the child finally reached the age of 18, her family asked for her contact information but they were rejected again. The service officers just told them Line would find them if she wanted to. Since then Line Jensen has not contacted them. Line's mother is now married to Aytekin Bozkurt, who shared details of this daunting story with Daily Sabah. In 2007, his wife was pregnant and was taken to the hospital for a stomachache. Looking at the woman's previous reports, the physician said she was using drugs. Bozkurt said that this claim was entirely made up and baseless. Denying this, he made his wife take all necessary tests to prove that she has never used drugs. "She didn't even smoke," he said. Even the doctor was amazed by the results and put the blame on the Barnevernet's reports. After Bozkurt's daughter was born, the Barnevernet also tried to take her away from them. "They tried this for six years. I wouldn't let them do this. I had cameras in my home and showed them every movement. They harassed me all the time, just because my wife's children were taken, they meant to take our child as well," explained Bozkurt.